You may not recognize the name. He was the Sheriff of Fayette County, Texas for 34 years after serving 13 years as its Chief Deputy. One might conclude that he must have done something right, at least in the eyes of Fayette County voters, to have been returned to office so many times. It’s important to point this out, because virtually all that is written about his career relates to the closing of a whorehouse. It began with the “breaking news” story by Houston’s Channel 13 television personality Marvin Zindler, that there was a whorehouse in LaGrange, Texas. Never mind that the whorehouse, long known as the Chicken Ranch, had been in operation since about 1844. It was big news once Texas’ political figures, from the Governor to the Director of the Department of Public Safety, faced the television cameras and expressed their surprise that there was a whorehouse in Texas. The entire episode was so comical that a stage show, The Best Little Whorehouse in Texas, was produced and became a Broadway hit. It was also made into a movie starring Dolly Parton and Bert Reynolds. A number of ridiculously amusing events and interviews revolved around Zindler and his battle with the Sheriff. 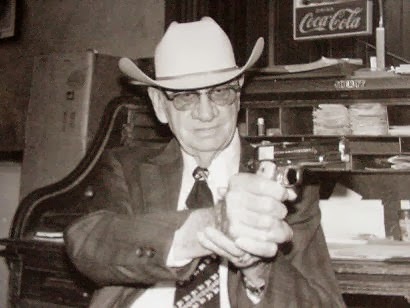 One headline in People Magazine proclaimed “Marvelous Marvin Meets the Meanest Sheriff in Texas” after Zindler returned to LaGrange for a follow-up story. He was confronted by Sheriff Flournoy, who promptly snatched Zindler’s powdered toupe from atop his head. The newsman extracted himself from the altercation and hot-footed it back to Houston, where he filed a lawsuit alledging the Sheriff broke two of his ribs. The suit was eventually settled. Sheriff Flournoy was not bashful concerning his apathy toward having a whorehouse in his county. He is quoted in a Texas Monthly article from the time. The second statement was apparently made as justification for having whorehouses in communities and, sadly, reflects his view of black residents in his county. His comments suggest that he was a man who wasn’t changing with the times. There were allegations that he and the owner/madam of the Chicken Ranch, Edna Milton, were romantically involved. In 1958, he was said to have installed a “hot line” from his office to the Chicken Ranch. But after pressure from the Governor and Attorney General, brought on by Marvin Zindler’s reporting, he finally capitulated and told Edna to close it down. In 1980, Flournoy decided not to run for re-election. He said he and his wife never wanted to hear about the Chicken Ranch again. At his funeral, two years later, he was credited with solving every murder and bank robbery in Fayette County during his 34 years as sheriff. Some creditied residents of the whorehouse as aiding him in his criminal investigations. Little else is readily available about Flournoy’s career. We know that his brother, Mike, was a sheriff in Wharton County, and another brother, Buck, was a Texas Ranger. He and Mike had reputations for exacting justice with intimidation and heavy hands. That, however, was not unusual during the time when they began their careers. Is it poetic justice that this long career in law enforcement is summed up by the closing of a whorehouse? I’m not sure, but I found little else to distinguish his legacy. Shenanigans in high places isn't surprising, of course. The possible hotline between the sheriff and the Chicken Ranch, however, strikes me as a big arrogant, and a slap in the face of public tolerance. But, as you suggested, things were a whole lot different back then.